Our apologies, but your web browser does not support the features required to view this site. Please upgrade to any version of Firefox, Chrome, or Opera, or to Internet Explorer 9 or above. Doing this will also give you a safer and more enjoyable web experience. Self-Help’s mission is to create and protect ownership and economic opportunity for all. That means making loans to people who aspire to buy their first home or launch a small business. It means building stronger communities by lending to nonprofits, community health facilities and public charter schools. It means investing in communities that have been forgotten. And it means standing up for fair public policies that promote wider opportunities for the working families we serve. Economic opportunity requires access to fair and affordable financial services. Through our state- and federally chartered credit unions, we now serve almost 100,000 members through 41 branches in North Carolina, California and Chicago. We offer both traditional financial services and specialized products to help members build wealth and economic security. Self-Help Credit Union’s annual member meeting, held in the newly renovated Maureen Joy Charter School. In 2013, we welcomed 11,000 new members through a merger with United Services Credit Union, which has served western North Carolina since 1954. We also introduced new products and services, including mobile banking and a WealthBuilder loan for members with high-cost credit. Helping families in California and Chicago. In 2013, we provided our members with responsible financial services, such as small-dollar loans, checkless checking and loans for young immigrants. We also offered hybrid check-cashing/credit union services to nearly 20,000 unbanked customers. In Chicago, where Self-Help stepped in to purchase the operations and loans of a failed bank, we helped more than 130 families avoid foreclosure. Abusive loans, hidden fees and financial “tricks and traps” cost Americans – especially communities of color, seniors and the military - about $65 billion each year. 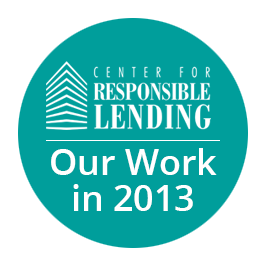 Our Center for Responsible Lending brings together consumer and civil rights, social justice, asset building and antipoverty groups to fight these threats through research and advocacy. In 2013, CRL released new chapters in its groundbreaking “State of Lending” series and further expanded its scope to include student loan and debt collection abuses. Holding the line: No new states authorized payday or car-title loans in 2013. We helped to create the new "Qualified Mortgage" rules that will help avoid another housing crisis and bring the market back to safe, sustainable lending. The Consumer Financial Protection Bureau has returned over $3.8 billion in refunds and relief to almost 13 million consumers. We worked to keep the CFPB strong and able to do its job. Many banks were in the business of making triple-digit interest payday loans to their customers. In 2013, we worked with regulators to put an end to this debt trap practice. We conduct research that informs national and state policy. Our comprehensive research series, State of Lending, brings to light abusive financial practices and empowers fair lending advocates. Owning a home is the main way most families in the U.S. build wealth and financial security. Lower-income families and communities of color were particularly harmed by the housing downturn. They're also most at risk of being left behind during a recovery. We make responsible mortgages and develop affordable housing to make homeownership a reality for lower-income families. Elizabeth Mobley and grandson Knoah. A Self-Help loan helped Elizabeth buy her home, just a block from where she grew up in Charlotte, N.C. Lending to working families for 30 years. We made 479 home loans in 2013 – more than we’ve ever made in a single year. Our flexibility allows us to serve borrowers of all kinds, including families with high aspirations but low resources. We also work with troubled borrowers to help them avoid foreclosure. When the balloon payments on their overpriced mortgage kicked in, the Davises couldn’t keep up and lost their home. With a new, more affordable loan from Self-Help, they're now homeowners again. Watch the video. Building and financing affordable housing to help families, neighborhoods and communities. The effects of the mortgage crisis persist: damaged neighborhoods, families struggling to recover from foreclosure, and lower-income buyers shut out of the market by cash-ready investors. We develop and finance affordable housing to help solve these problems, focusing in hard-hit neighborhoods where our investment will make a strong impact. A healthy stock of commercial buildings, affordable homes and neighborhood spaces are critical to a thriving community. We buy and rehabilitate run-down and vacant properties to create new homes, to revitalize commercial areas and to house community services. One of the 19 homes and apartments Self-Help developed last year in Charlotte, N.C., in partnership with Crossroad Corporation for Affordable Housing. Redeveloping historic buildings and downtowns. A $10 million renovation turned a vacant, century-old building into a new home for Maureen Joy Charter School in Durham, N.C. The makeover employed cutting-edge green technology. The result: a beautiful energy-efficient space for a public charter school offering high-quality education to 600 mostly low-income students. Businesses and nonprofits create jobs, provide needed services and generate community wealth. From small operations to multi-million dollar projects, we lend to enterprises that spur economic growth and fill community needs. Our specialties include education, green lending, healthy foods and affordable housing. Tyler Kober, owner of Bullseye Bicycle. A loan from Self-Help’s SBA 504 program helped him expand his downtown shop and hire more employees. A member of the lending team visits Self-Help borrower FLS, a solar energy company that will create 25 million watts of clean power each year. Lending to projects that make a big difference. We make loans that have a positive impact for local economies and communities. In 2013 our lending included complex commercial real estate projects, big loans to public charter schools and more than $11 million in loans to solar energy installations across North Carolina. Every child deserves access to a high-quality education. We lend to child care centers and high-performing public charter schools that address the achievement gap. In 2013, we lent $62 million to community service providers like charter schools, child care centers, nonprofits and affordable housing developments. We're building on the successes of 2013, but can't do it alone.